Had a good experience doing this project. I have wanted a Telecaster and this kit made it possible. ( finished guitar is at Guitar tech being set up properly) Hoping it sets up as good as it looks. Used gun stock oil on the neck and it turned out really nice. I used a Min Wax High gloss product for the body. It was fairly easy to do. Just take your time and make sure you understand the steps. I plan to do another. for the money these guys cant be beat. Go buy a guitar neck and body elsewhere. The quality for the money really is spectacular. Not to mention they keep building on their products making it super easy to build whatever you want and a fraction of the cost. Also njce to learn about the builds. Gives you more respect and appreciation for your instrument. Keep doing what you do guys. Ill be buying plenty more bodies necks and kits in the future. Oh also customer service is amazing. Very quick response always. Everything was exactly as claimed. Body is nice, good wood grain. Neck excellent. Hardware, pickups etc. are adequate. Had a lot of fun sanding and finishing the body in satin finish clear varnish. Looks awesome. Added a Bigsby type tremolo. Works great! Hope to build another soon. Very good experience building this kit. The neck was nicely prepared with just a little fret polishing needed. All pieces fit together perfectly with no adjustment other than normal neck setup. The components were better quality than expected. Only weakness is in the tuners but they are adequate. The process of sanding, finishing and assembly was an enjoyable one. May just have to do another. I recently ordered and received this Kit and I must say it is absolutely awesome! Bang for buck is amazing and I loved the finish. My only concern is that the selector switch that came in the Kit is faulty so now I am looking for a new switch. 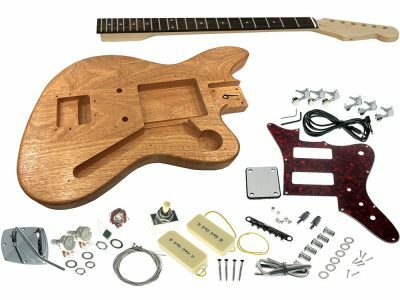 For anyone reading these reviews especially, I would like to point out that the experience of building your own guitar is a lot of fun and with the quality provided by SOLO you simply can’t go wrong and I highly recommend them! Thanks for your review of your TCK kit ! We appreciate the kind words very much. Very glad to hear you were happy with the quality of your kit. Would you like us to send you a replacement switch ? If so, please send us the address you would like your replacement send to and we will get that out to you ASAP. I must say, same day response and it was emailed directly to me as well. I am extremely impressed. They are going above and beyond even after I purchased and that means almost everything to me. Great, great, great company to work with. I received this as a Christmas gift this year and was super stoked I couldn’t wait to get working on it. I just completed it and I am very pleased with this guitar, looking forward to jamming with it tonight. It was a lot of fun to have a hands on custom guitar experience. I would definitely recommend these kits to anyone who plays guitar. I am already looking at what kit I will get next. I really enjoyed this project. The price was great! Everything was included. I’m still working on the setup but that’s a good thing because I’m learning a lot. I’ll be getting another kit before long. I did have a question and the response came very quickly. A happy customer from Halifax. Bought a lefty Tele from Matt. Product sure looks great and well machined! Service , communication, follow- up from Matt @ SOLO is excellent ! 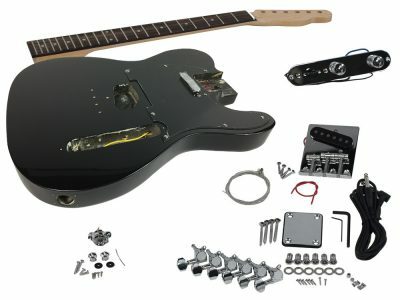 I looking forward to mounting this Tele kit. Will purchase additional items in the near future. Thumbs UP to all at SOLO ! I was happy with the product as a whole. I was not happy that the body had a very odd looking plug in it that was not the same color wood as the rest. Like it was drilled out and plugged. This would preclude staining the body. So, I decided to paint it. Credit goes out to Solo, I brought it to their attention and they offered to let me send it back. I chose to keep it and paint it. Quick delivery, nice kit easy to build. A special thanks to Matt for is prompt response and good support and advices. Next project will be the stratocaster style guitar and later the PRS and also…. I had always wanted to try something like this and after waiting for the Tele kits to come back in stock I was excited to get at my winter project. My goal was to learn stuff about wood finishing and get enough of a taste of guitar building to know if I wanted to go further with it. If I got a playable instrument out of the deal I’d be very happy. I built the tele-style in plain basswood. I had considered a nicer wood but thought I’d use this one as a learning tool. The wood is not beautiful but it is adequate, and there are some interesting areas of woodgrain. The neck is nice maple and the frets and fretboard needed nothing. I spent a ton of time sanding and researching finishing options. I went with Keda wood dyes and Tru-Oil, and picked up some micro-mesh pads as well. The only thing I’d change would be that there is black binding already installed on the top, which got in the way of sanding. It would sand, but at a different rate than the wood. This is a minor complaint. After finishing (took about six weeks, taking my time and doing lots of coats), assembly was very easy. All the holes were perfect except for one that I had to re-drill (pretty good considering there’s probably two dozen holes) and the guitar went together very quickly and everything fit nicely. The soldering was another learning curve for me. There is not a ton of extra wire so one needs to be careful, but it wasn’t too difficult. The guitar looks great and I’m super pleased with it. It was a really pleasant way to spend winter evenings, sanding and polishing and messing around with stain. I am still sorting out the setup and intonation, as again, it’s a learning curve, but it tuned up and the pickups are fine. It sounds like a Tele. The switch gear has a nice solid feel to it. I have read reviews elsewhere that are somewhat dismissive….the key here is that this was a very attractive price point and it is an entry-level project. 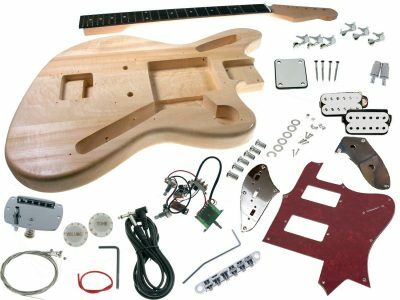 Yes, you can get heirloom-quality guitar kits with fine tone woods and high-end electronics, but you’ll pay a LOT more and it’s not fair to compare apples to oranges. This kit delivered exactly what it promised, for a very reasonable price. 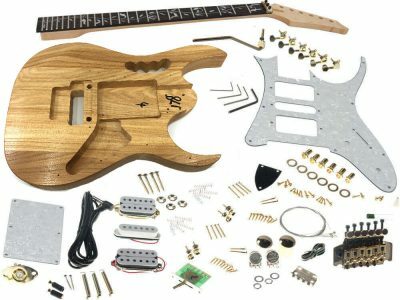 It allowed me to get a taste of guitar building without spending a lot of money. I spent less than $200.00 in total and had a blast, and have a guitar that I’m proud to show off. I will absolutely be doing another, notwithstanding that I don’t actually need another guitar…..
Matt was super helpful, answering my dumb email questions very quickly. This is above and beyond service. Five stars for a solid product and excellent service and support. Prompt delivery, kit went together well but I did do some personal adjustments. The neck set very well and once together sounds fantastick. If you want a kit to customize this is your kit. 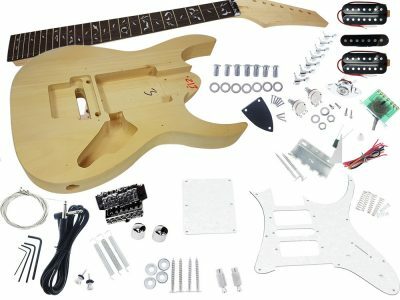 I really didn’t know what to expect since this was my fist time purchasing and assembling a DIY Guitar. I’m not used to craftmanship that much. I must say, I was really surprised with the quality of the product. 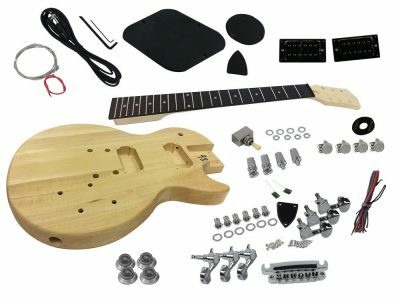 Once it was finished, my Solo Tele Style DIY Guitar Kit, Basswood Body sounded as good as my two Gibson Les Paul (Studio and CM). I’m almost regretting spending 1000$ on each of these guitars while I only spent 130$ on this one that sounds and feels awesome! I’ll be purchasing one or 2 more of these guitars in the next month for sure! Since I was younger I wanted to build a guitar and the tele was always a favourite of mine, enjoyed all the work that went into to building this guitar. The bridge are very comparable to the ones I played on when using a original tele years ago, but am looking to replace them with the fender bridge Solo sells, I am firm that each string should have it’s own saddle to ensure better intonation while setting up the guitar. In saying that, what comes from Solo as the kits still stands up very well in my studio and I am impressed with the pickups that ship with the guitar. Great products SOLO, looking forward to possibly building a Strat next. This is my third kit, after a jazz bass and, a jazz master. As you get used to building these kit, the results get better and better. This one looks great, sounds great and, plays great. Thanks again Matt, for the tip on the electronics. P.S. I’m working on an acoustic right now. Received my first solo kit about 3 days after I placed my order. It’s a basic tele with basswood body and maple neck with rosewood fretboard. Everything well packaged and all hardware screws etc in separate zip locks. Every last piece was in the box right down to the smallest screw and matched the description in the assembly guide. Every hole was predrilled to proper size and depth. The neck pocket had the same taper as the neck and fit tight and straight. Everything went together in a few hours with no modification necessary. The neck and body needed the 3 sanding steps mentioned in the instructions and came out flawless. There’s just nothing wrong with the fit. Electronics were easy to assemble and work well. Very nice kit and great value at a modest cost. This kit more than met my expectations. Great to work with a company like this. I wanted to give 6 stars. Nigel from Spinal Tap would have. His volume knob goes to 11. Seriously, I am so pleased with my purchase. The body and the neck were in great shape. Both exceeded my expectations. All of the other parts were well packaged and of good quality. The customer service was exceptional. I will buy other products for sure! 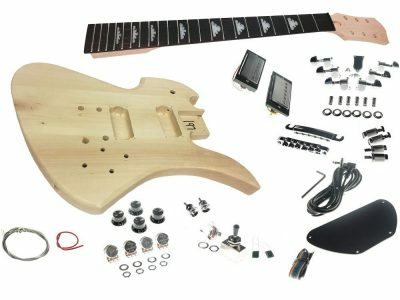 This is my first attempt at kit building a guitar. Great components,price and shipping. Ièm looking forward to the experience. Super fast shipping – neck to body fit perfect- pots and selector sw surprisingly smooth- mine has a really nice fretboard- some weird grain stuff going on with the three piece body- but I’m probably painting it solid anyway. A little tricky to set up the 3 piece bridge – no more difficult than keeping a Les Paul in tune though. Been around guitars for 40 years and for 139 bucks… I would strongly recommend this kit to anyone. The guitar I ordered arrived the next day – I was impressed, but when I opened the box and fit the parts I didn’t expect it to fit so well, so doubly impressed. The body is 3 pieces with a small gap in the top, and a weird mushy spot in the back, but my plan was to paint it black, so that was fine. I Tru-oiled and waxed the neck, dressed the fret ends which were a bit sharp (just used sandpaper to knock the edges off), scalloped the 15-22 fret (love that it has 22 frets! ), and put a Fender decal on (I’d be happy to use a Solo decal next time, if you put it in the kit 😉 I really like the black binding, but I had a few mods in mind, incl piano black finish with cream binding, Jeff Beck-style neck heel (I forget what Fender line uses this), waist cutout, reversed control plate (pickup switch at the back, volume at the front), and staggered tuners so I wouldn’t need string trees because I wanted to bend behind the nut w/o strings popping out of the trees. The binding came first, but getting the black binding off was really hard in places -some parts would peel off easily and some areas I had to cut away with a knife, which slipped a few times and made some gouges. The cream binding I ordered from China was complete crap -it keep breaking because some parts were really brittle and others were flexible, and when I used a heat gun some parts would soften and others would instantly droop and warp, so it was hell, but after 4 tries I got it OK. The lesson is buy Stewmac binding if you want to try this. I had a few minor hiccups because I ordered binding, neck plate, and other parts from China, and some took over 3 months to arrive. I was impatient, so started finish work w/o all the parts, so there was a bit of rework involved, but in the end, it came out so freaking well I’m stunned. The only part I really HAD to replace was the absolutely horrible jack which led to intermittent signal, even after bending the tab -a $3 Switchcraft jack took care of that problem. Playability was really good (the Jeff Beck neck plate makes a HUGE difference), but the action was a tad higher than I like, so I levelled the frets (minor levelling) and got the action way down. I’ve never had single coil pickups (Les Pauls, Eddy-inspired partscaster w X2N, etc), so I wasn’t prepared for the hum! I really like the sound, but the hum had me looking at noiseless (Fender, Kinman, Fralin, etc. ), then I decided to try to learn to live with them for a while like others have before I change them. Anyway, I love this guitar, and now want to get a PBass. Amazing product Solo, thank you! Solo just flat Rock’s !!!!! Bought a kit, 4 day diliv, at christmas,!!!!! one or two small thing’s, but Matt was right there to take my call, let me rant,and say thank’s for the call. So good on ya guy’s i look forward to many more kit’s and the GREAT SERVICE!!!!! so far, i have at least 4 people checkin out SOLO GUITARS, for there first DIY kit. i know SOLO will hook them up! I’m not normally one to leave reviews or ratings, but this product deserves one. Shipping was fast, the product was exactly as advertised, and Matt and the staff at SOLO have been great! Everybody who has seen or tried out my new TC has been impressed at the quality and are seriously considering building one themselves! Great job guys, looking forward to playing and building more in the future. Bought this for my husband for Christmas, I am very pleased with the whole process thus far, speedy delivery. My husband is really looking forward to this project so I will have him write a review when he is done!! I got 2 kits as Christmas gifts from my wife. Best gifts in a very long time! Got the Strat and Tele. Assembly was a breeze. Neck fit great, etc. Did the Strat first with a 50’s style teal color and amber varnish stain on the neck. I love everything old, so I decided to do a relic job on it. Every chrome piece, screw, etc. A lot of work, but well worth it! I now have a guitar that looks like and old Strat. Btw, it plays well too. A couple frets were a little high and after watching videos on necks, I found most people do leveling on brand new necks. I did that, set the relief and bridge saddles, and wow! Nice action! I pretty much did the same on the Tele neck and did a walnut stain on the body with poly clear. Turned out great! I love both guitars. They play and sound very good! And I have my 2 favorite guitars…after all the finishing and relicing supplies for less than $400!!! Can’t beat it! Very happy customer! Fun project! Setup was a breeze and much easier than I had imagined. Only downside is the setup/action is pretty bad. However, I spent about an hour adjusting the nut height (used a $5 file kit on amazon), adjusting bridge height for each string and adjusting intonation. Luckily the neck was straight and adjusting the trussrod was not necessary After these modifications, it plays great. Also, the fret board was very very very dry. I added olive oil several times and that gave it a better, more hydrated feel. This kit is great. Took no time to ship to me. Sanding was easy and everything fits as it is supposed to. The wiring instructions on the site are perfect. Once I put everything together and setup the guitar, it sounds great! This will not be my last purchase. Thanks. Best $109 you can spend on a guitar if you have a few hours and some basic tools. My kids loved helping me finish it and although it has a kid-quality finish, it still looks great, it plays well and has a 6 and 10 year old now wanting to play. It’s going to be hard not to get and LP package to build, but I don’t have enough wall space to hang all the guitars I want! This was my first kit, and a good experience overall. Comes with easy to follow instructions, and Matt is really helpful if you have any questions. I gave 4 stars, mainly because the control plate was stained with glue or sealant and I couldn’t get it off completely. Some of the frets are also a bit short. Otherwise it’s a good quality, totally playable instrument. Assembling and finishing an instrument really gives you a special connection to it. I’m a guitar tech and have been for 20 years …. These Teles are a great product for the money … l have built many of these for my Clients ,, both the rosewood & maple fretboard models .. Many of my Clients regularly play gigs,, and sometimes in very dodgy places.. Instead of taking thier $1500 guitars to these gigs with the worry of having them stolen ,, they have me build these Solo Kits ,, They look great on stage,, sound and play great for a fraction of the cost .. I purchased the Telecaster kit TCK-1 DIY from Solo recently and after assembly and minor lowering adjustments to the nut I found the guitar fantastic.Quality all around is amazing.One fret 2nd fret low E string ONLY had a minor issue but filed it down cause of a slight buzz.I replaced the kit pickup mount tailpiece with a Fender one to install the Fender Ashtray chrome bridge cover as I like the look.I also installed string ferrules so the strings would go thru the back like Fenders.I bought a 5/16 forstner bit on Amazon and luckily I have a drill press which is a must if you do that upgrade to come out straight and even.It brought back a lot of nice memories of a 1968 Blonde Telecaster I actually owned as a kid.All and all will soon be buying another Telecaster Kit this time with the F hole possibly not sure or maybe a Jazz single cutaway if possible.Love the guitar highly recommend this kit to someone who wants to have some fun and build your own Tele Style guitar.People at Solo are fantastic too and delivery was fast from Ontario ,Canada to Shirley,N.Y. in couple od days….Glenn in N.Y. Ordered this kit and it was delivered the next day. Took a week to stain and varnish before final assembly. Slight issue I had was the headstock nut being too high resulting in ‘sharp’ notes when playing on the first few frets. A quick call and a chat with Matt put me in the right direction. I replaced with an TUSQ nut and everything is great. I put in a small neck shim and now the action is excellent. Plays and sounds really great. Can’t believe how little these guitars cost. Certainly amazing value for money. Easy and fun to build. I would also like to say how great the customer support is – they certainly go the extra mile. A really friendly and very knowledgable bunch. I wouldn’t hesitate to recommend these guitars to anyone. Clear, simple instructions ( and amazing customer support ) make them a breeze to build. Amazing! Delivery was super fast as usual and the quality of the kit made the build go as smoothly as ever. No touch ups necessary. Sounds and looks like a million bucks. I just received my kit and I gotta say that for the price this is a very well made kit. The neck is amazing quality and the body and electronics are great as well. The only thing was is that the neck cavity seemed to be routed too large because the pickguard hangs over the edge a little bit and the neck will need to be shimmed for sure. But other than that everything else seems to be perfect. Just finished my kit, been working on it for a month or so. When received I was a bit worried about the neck fit, seemed a bit sloppy as compared to some of the videos I have seen on YouTube with other Solo kits. However in the end I am very pleased with the entire project. No shims needed for the neck for my action to be just right for me. I did however have to level the frets and fret dress, but that was expected. I used tung oil on the body and neck, it really brought out the mahogany in the body, I used linseed oil on the fret board which gave it a rich color.. I did replace the single coil pick-up for the neck with a Seymour Duncan ’59, no routing needed as it was routed large enough!! I also replaced the saddle, pick-guard and the machine heads. Don’t get me wrong I think the pick-up, saddle and machine heads would have been completely acceptable from SOLO, however I wanted to have my own preference there.